Note: We recommend taking your head to a machine shop if your valve seats need work. 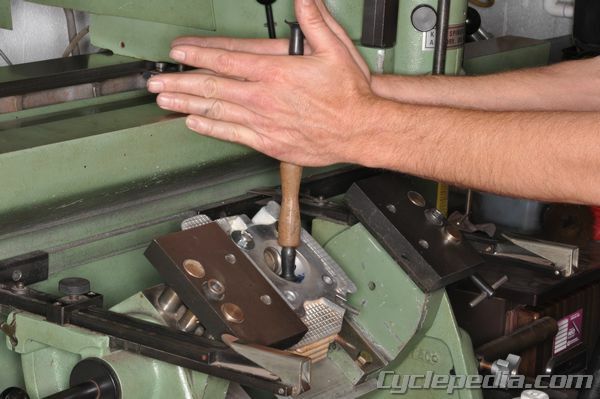 Note: This chapter shows the basic steps for repairing valve seats by lapping the valves. Each engine has its own specifications for valve seat angles, and you will find these specifications in your Cyclepedia manual or the factory service manual. 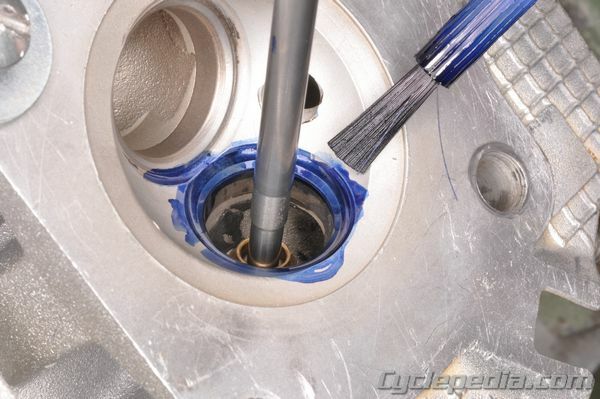 Inspect the valve seat for an uneven seal and pitting. 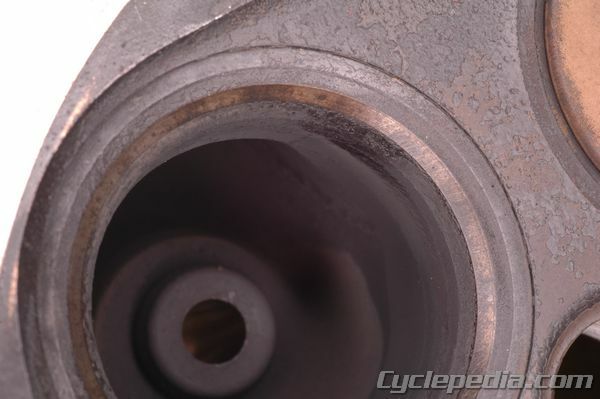 The valve seat should be resurfaced if it is damaged or uneven. Coat the valve face with a thin layer of Prussian blue and install the valve into the guide. Using a valve lapping tool, spin the valve in a back and forth circular motion while applying downward pressure onto the valve. Pull the valve up and look for a complete impression of the Prussian blue all the way around valve seat. 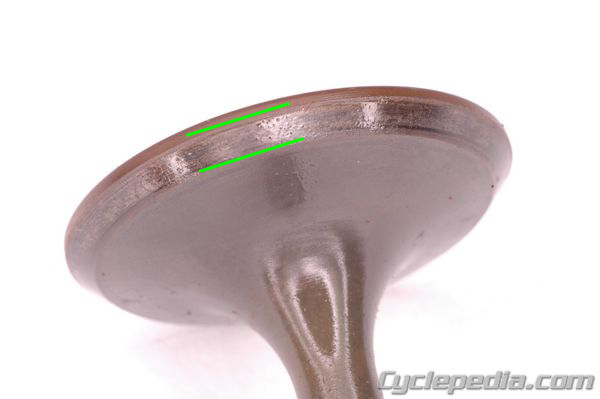 If there is a break in the marking on the seat, you will need to re-cut the valve seat. Measure the width of the valve seating surface. If the measurements are out of specification or inconsistent around the circumference the valve seat must be repaired with valve cutting tools. The valve seats have three different angle cuts to them, and each are cut by special cutting tools. Use the tool manufacturer’s instructions for cutting. (Note: Each engine is different, and the selection of angles here are typical but not universal. Check your Cyclepedia manual or the factory service manual for complete specifications). The first cut is made with the 30° cutter, the second cut is made with the 45° cutter, and the third cut is with the 60° cutter. Rotate the cutter one to two times in a clockwise direction to clean up the seat. Note: Never turn a valve seat cutter counterclockwise as this will dull the blades. If pitting is still evident repeat the process. NOTE: Cut only the minimum that you need. 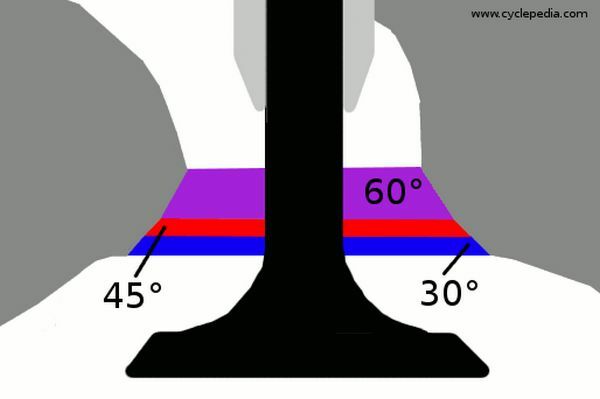 If the contact area on the exhaust is too wide you will need to use the 30° and 60° cutter. This will help narrow the fit of the valve to the seat. If the contact area is too narrow you will need to use the 45° cutter. If the valve seat is too low, narrow, and near the margin use the 30° cutter to raise the seat and then the 45° cutter to widen it. If the valve seat is too high and narrow use the 60° cutter to lower the seat and then the 45° cutter to widen and center it. Lap the valve seats with lapping compound. 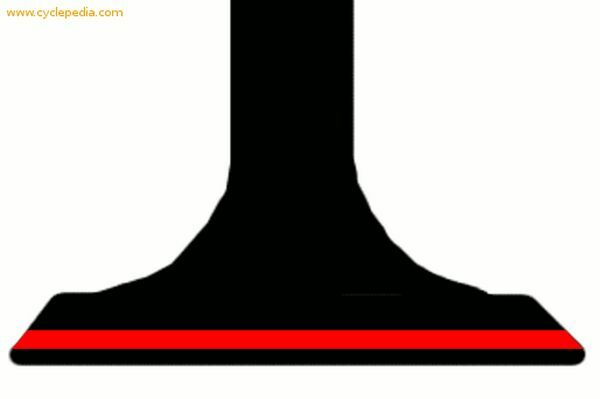 Use light pressure, and do not allow the lapping compound to get into the valve guides. When you are finished thoroughly clean the lapping compound off of the cylinder head. Nice write up and excellent photos and visual aids as well.